Pandit Deendayal Petroleum University’s 100 acre campus is located in Gandhinagar, which is the capital city of Gujarat and located 23 Km North from a well developed city called Ahmedabad with a population of 8 million people. The city is famous for its remarkable cultural development and social life. PDPU offers multiple courses ranging from engineering, arts and management along with maximum exposure and opportunities to its students through various national and International exchange programs with Best Universities worldwide. For development of its faculties and staff the University endeavors for various Joint Exchange and Research programs. 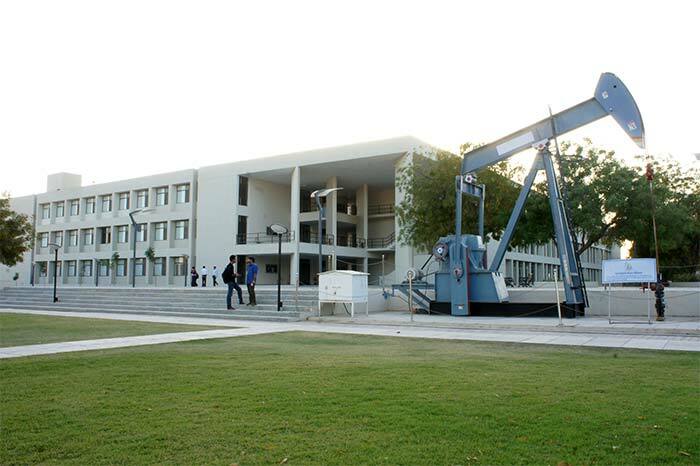 Pandit Deendayal Petroleum University (PDPU) has been established by GERMI as a Private University through the State Act enacted on 4th April, 2007. The University offers programs to address the need for trained human resources in the domains of Science, Technology, Management and Humanities. It intends to broaden the opportunities for students and professionals to develop core subject knowledge which are duly complemented by leadership training interventions, thereby helping the students to make a mark in the global arena. This objective is being further addressed through a number of specialized and well-planned undergraduate, post-graduate and doctoral programs as well as intensive research projects. School of Petroleum Management offers M.B.A. in (a) Energy & Infrastructure and (b) General Management, Ph.D., Post Graduate Diploma in Petroleum Management for Executives (PGDPM-X) and Management Development Programmes. School of Petroleum Technology offers B.Tech., M.Tech. and Ph.D. programs in Petroleum Engineering. It is academically engaged in creating a high quality talent pool for the hydrocarbon sector across the entire value chain. School of Technology offers B.Tech. in the fields of Civil, Electrical, Mechanical, Chemical, Computer & ICT besides the Ph.D. Programs in the above areas. It also offers M.Tech in Nuclear & Solar Engineering and other disciplines. School of Liberal Studies offers four year Bachelor programme in the field of Liberal Studies, M.A. in Public Administration/ International Relations/ Political Science as well as the Ph.D. programs. Emphasis on problem solving and practice with sound fundamentals, through active and continued partnership with energy & infrastructure sector companies and National and International Universities, Consultants and Vendors. Top down approach from ‘Systems to Components’ to better appreciate holistic education. Rural, Industry and Research internships to provide a better understanding and challenges faced in rural and urban Indian landscape, industry culture and career options for students. Emphasis on holistic engineering as key to long-term economic and environmental sustainability of communities.